Home » » Save those Cheese Rinds! Last September I gave a small lecture at the Cape May Food and Wine Fest in NJ. While I hope everything I talked about was in some way useful, I was really surprised by how everyone seemed so invigorated by the idea that they could save leftover cheese in olive oil. But it makes sense; I feel like most people find themselves with a few ounces of leftover cheese from a recipe or party, but don't know what to do with it. So it usually dries up or molds, then gets tossed in the bin. Some cheese makers sell marinated feta or chevre, but in general I think it's a better idea to make your own (and much, much cheaper). You don't need to start with exceptional cheese, since you're going to marinate it anyway and the spices/herbs you add with alter any nuances in the cheese. Plus, this is a great way to use up odds and ends. The mason jar to the right is filled with wedges of Manchego - mostly the cuts closer to the rind which can be a bit dry. That's marinating in extra virgin olive oil with blood orange zest, fennel seeds, and black pepper. 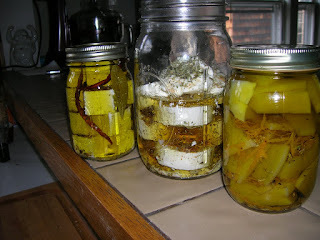 The middle jar has medallions of goat cheese in walnut oil with herbs de Provence and espelette chili powder. Lastly, the far left jar is feta with dried chili peppers, bay leaves, oregano, and black pepper, all covered in olive oil. You can use any firm feta (some people refer to it as "Bulgarian Feta," which can be denser and less crumbly, but not all of it comes from Bulgaria), although I used Valbreso Feta. Valbreso feta is made with the leftover milk from the Roquefort cheese making process. It's not too salty, with apricot and other fruit flavors to it. These little jars will add a few more weeks to the cheese's life and are great for tumbling into salads, or just eating off bread. Plus, after the cheese is gone you're left with an herb infused olive oil for making vinaigrettes or pouring over roasted vegetables. And you can throw in any herbs or spices you want. I once made a marinated goat cheese with star anise and white pepper that was pretty wild. Just becareful about using fresh herbs - since they have water inside them (and no salt, unlike the cheese) you may run a risk of botulism by putting them in the oxygenless environment of the oil. If you do use fresh herbs, just make sure to keep the jars in the fridge. Interesting - I'll have to try it! Your photo of the jars of cheese in olive oil made me think of a zoology lab with specimens of fish and frogs and lizards preserved in ethanol. Funny -- they are your old ethanol jars! Reduce, recycle, reuse!